... We all had a great time "hearing the band" at the Kit Kat Klub. Presented in the intimate theater at Stageworks/Hudson, this true tale of bigotry, intolerance, religious prejudice, and social upheaval played to 6 great audiences. They enjoyed complimentary hors c'ouvres at each performance courtesy of Chef Jeff Loshinsky and Loshinsky Catering, and on opening night sampled the fine wines provided courtesy of (p.m.) wind bar. 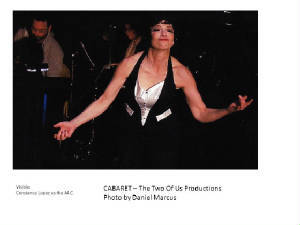 The Two Of Us Productions, a local theater company based in Copake NY, is bringing CABARET, the award winning musical drama by Joe Masteroff, with music by John Kander & lyrics by Fred Ebb, to Hudson, NY. Presented in the intimate theater at Stageworks/Hudson, you don't want to miss this true tale of bigotry, intolerance, religious prejudice, and social upheaval. At its' heart CABARET is a dramatic commentary told through three parallel story lines: the younger couple who are denying reality, the "toast of Mayfair" Fraulein Sally Bowles and the aspiring novelist Cliff Bradshaw from America; a dramatic & romantic sub-plot of love denied in the endearing older couple Fraulein Schneider and Herr Schultz; and the social commentary of the Master Of Ceremonies that was played by Joel Grey in the original productions and the 1972 movie. The Kit Kat Klub performers that this show is so well known for support the Master of Ceremonies in commenting on the dark cloud of National Socialism that is engulfing 1930's Germany, and how the gathering storm is impacting the principle characters. As a special treat on opening night join us for a free glass of wine, courtesy of the (p.m.) wine bar. (p.m.) wine bar will also be open apres-show to continue the party. We will also be featuring complimentary pre-show hors d’oevres for every performance courtesy of Chef Jeff Loshinsky & Loshinsky Catering. 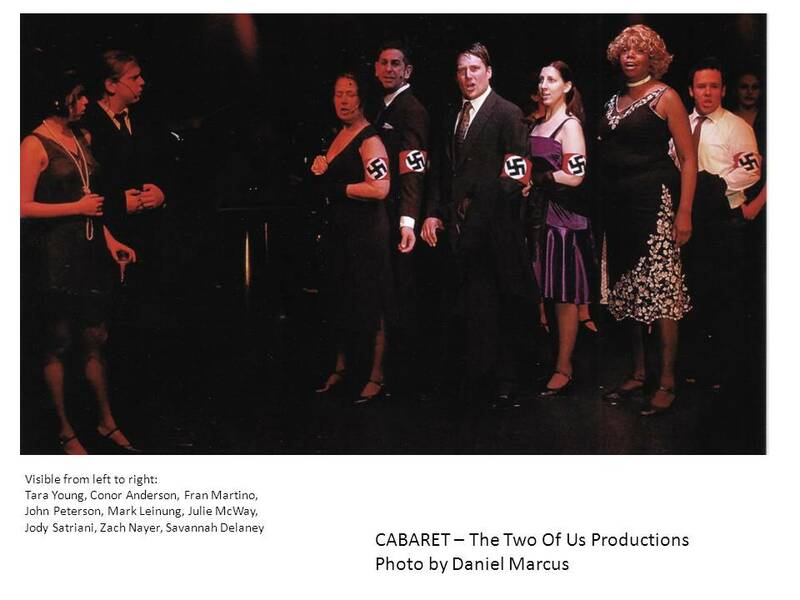 CABARET features Constance Lopez as the M.C, Tara Young as Sally Bowles, Conor Anderson as Cliff Bradshaw, Louise Pillai as Fraulein Schneider, James Jollie as Herr Schultz, Mark Leinung as Ernst Ludwig, and Jody Satriani as the always hospitable Fraulein Kost. CABARET also features a dynamite group of singers and dancers on-stage at the “Kit Kat Klub”, including Fran Martino, Beth Jacobs, Julie McWay, Savannah Delaney, & J.T. Jollie, and also Zach Nayer, John Peterson, John Trow, and Chris Jollie. The singers and dancers will be accompanied by a live orchestra, so the character Sally Bowles really means it when she says “come hear the band!”. The Two of Us Productions is well known throughout the Hudson Valley for presenting quality theater, both musicals and dramas. One of their trademarks is presenting musicals with full orchestras, a rarity that is a great treat for their audiences. They have performed at a variety of venues throughout the area including: Ragtime at the Taconic Hills Performing Arts Center; Chicago at the BCC Boland Theater in Pittsfield, MA; Arthur Miller’s Broken Glass at the Valatie Community Theatre; The Owl and the Pussycat at the Cuneen-Hackett Theater in Poughkeepsie, NY; Christopher Durang’s Beyond Therapy at Stageworks/Hudson; They’re Playing Our Song at Rhinebeck Performing Arts Center; and most recently Jesus Christ, Superstar at the Hudson High School in Hudson, NY. CABARET is being presented at the Stageworks/Hudson Theater in Hudson NY. Performances are 2 weekends only, April 8th, 9th and 10th, and April 15th, 16th & 17th. Friday and Saturday performances are at 8pm and Sunday matinees are at 3pm. Tickets are $18 for adults, $14 for students & seniors, and $12 for groups & families. For advance reservations visit www.TheTwoOfUsProductions.org or call 1-866-811-4111 or 518-758-1648. Stageworks/Hudson is located in Hudson, NY - just steps from Hudson’s Amtrak station. For directions and parking please visit www.stageworkshudson.org/directions.html. Seating is limited, so make your reservations early!